At Asbury University, students are given unique opportunities to gain experience in their chosen fields. They are provided not only with the skills and tools needed to succeed, but also with the agency to find that success inside and outside of the classroom. The subject matter for the paper came to be when Merricks oversaw a group of undergraduate students, including Bowshier, as they worked to create a course framework for English 100, a freshman-level writing class. The student writing consultants helped select readings, draft assignments and create a framework of best practices for writers, teachers and professionals. 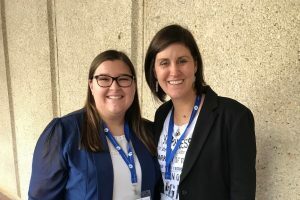 Merricks, Bowshier, Faith Neece ’18 and Sarah Browning ’18 then presented the course framework at the regional Southern Writing Center Association Conference (SWCA) in February 2018. There, an audience member made a suggestion that inspired the paper. Bowshier and Merricks discovered that student writing consultants learn and grow exponentially when given agency through opportunities such as the one given to Asbury’s consultants. Merricks is confident that the information she and Bowshier presented on will be helpful to other colleges and universities and sees clear ways their writing centers can employ it. Bowshier and Merricks co-presented with another director/undergraduate consultant team and attended some informative sessions at the conference. “We received positive feedback and lots of questions from our audience, and we were proud to share about the success of our English 100 course,” Merricks said. Learn more about the Center for Academic Excellence.